Photo by Blaine Meller. 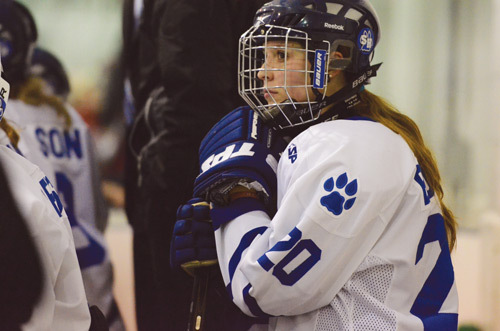 Kaitlyn Burke can’t hide her disappointment during the final moments of the Cougars’ 4-0 loss to SAIT March 18. Hindsight shows us that every cloud has a silver lining. But when gold is the goal, not even the shine of silver can mask disappointment. Just ask the Cougars women’s hockey team.Coming off a regular season in which the team only lost a single game in 24 contests, the Cougars were favoured by many to capture their second consecutive ACAC title and fifth overall. The team they were facing, cross-town rivals SAIT, had different ideas and in the end the upstart Trojans captured the best-of-five series in three straight games. Scores were 4-2, 5-4 in overtime and 4-0. The Cougars had several opportunities during the final game of the series, especially during the second period when they outshot SAIT 17-5, but just could not find the back of the net. Mount Royal head coach Scott Rivett said numerous factors contributed to SAIT capturing the series. “I think overall we played well, but you look at a few bounces that didn’t go our way, and we turned pucks over to players that we just couldn’t afford to,” Rivett said. The Cougars finished the regular season with a record of 21-1-2. They scored the most goals for (96), allowed the fewest against (34) and had the league’s top-ranked powerplay and second-best penalty kill. Additionally, the Cougars had six players in the top-10 in league scoring. After a hard-fought win over MacEwan in the semifinals, the Cougars faced SAIT, a squad Mount Royal went undefeated against during the regular season. Three of their games were decided by two goals or less, and two went to overtime, something not lost on Rivett. “A lot of our games were close, one or two goals. We were getting bounces during the season that were not going our way in the final,” he said. In the deciding game, SAIT held intermission leads of 2-0 and 3-0. Going into the final frame, Rivett said his team still believed they could mount a comeback and push the series to a fourth game. “We gave the players some time to share their thoughts and really step up to the plate. There wasn’t a lot of talk from the coaching staff, because we knew the girls were talking amongst themselves,” he said. After the final buzzer sounded, the disappointment on the players’ faces was evident. At least two players, Megan Price and Chelsey Morrill, are graduating and will not be with the team next season. For those players who are rejoining the squad, and those who will be making their Cougars debuts, the end to this season will hopefully serve as a reminder of what the end goal is, Rivett said. “I’m sure we’ll talk about the experience and try and learn from it. Every year is a new start, but you always have to be ready to push yourself to reach your goals. Ours will be to win an ACAC championship,” he said. Rivett already has a solid jump on preparations for the 2011-12 season. He said recruiting for next season is done, a feat he has never finished this early. Despite that, it’s too early to say exactly what next year’s squad will look like. “It’s sort of like a moving target. You have an idea of what you want it to be, but never really know what things are going to look like until you’re actually there,” Rivett said. One of the things Rivett will remember most from this past season is how close the team became, and the bond that grew between the players. “I think when I look back and reflect on this season, that will be the first thing I remember. It won’t be the wins or losses,” Rivett said.